In this report, Cushman & Wakefield analyzes office market fundamentals and compares the current quarter’s rental rates to those at the height of the last cycle. 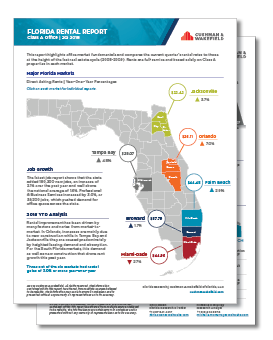 For the first time since this report started to publish, all major markets in Florida have rates above the previous cycle’s high. Florida remains a significant job generator. The latest job report shows that the state added over 180,000 new jobs, an increase of 2.1% over the past year, well above the national average of 1.6%. Rental improvement has been driven by strong demand and job growth in office using employment and significant new construction. For the first time this cycle, every major Florida market has new office construction, with the majority speculative space but with substantial leasing activity. Why Do Cities Poach from One Another?